Yesterday, while talking with someone, I used a phrase from the 1972 translation of the Mass - as we wait in joyful hope... It's a lovely phrase, like so many others which I miss hearing and praying. 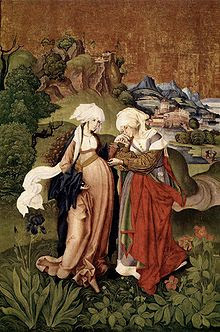 That phrase, and the fact that today we celebrate the Visitation, brought to mind a poem by Rainer Maria Rilke called Visitation of the Virgin. It is as much about the journey to Elizabeth as about the meeting. a journey undoubtedly filled with mixed emotions, anxiety mingling with anticipation and joyful hope. In Luke's Gospel the journey only occupies a few words and the focus is on the meeting, but in reality - as in so much of life - the journeying, the getting there, would have taken up the most time and effort. The poem also reminded me of this painting by the un-named Hungarian artist Master MS, from around 1500. A good friend gave it to me when I used this Gospel in my ceremony of first vows. It captures a lovely, serene, intimate moment between these two women, quietly rejoicing in their blessedness. It reminds us that in among the greeting, affirming, proclaiming, in with all the exuberance and exultation and the child leaping in Elizabeth's womb, there would also have been moments of quiet tenderness, reflectivity and deep, gentle love. She still walked easily in the beginning. Of her marvellous body’s life within. Around her, was her fullness, not the land. The greatness which she now could understand. They touched each other on the dress and hair. Used the other as shield in her plight. And did, leap in rapture of delight.